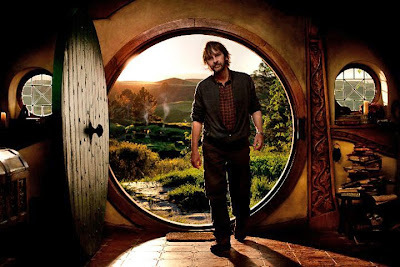 Lexicopia: The Hobbit begins production! After years of delays and set backs, production on The Hobbit is officially underway! Filming began today in Wellington, New Zealand. The Hobbit will be two films, directed by Peter Jackson and based on the classic novel by J.R.R. Tolkien. The first film is tentatively set for a December 2012 release. Only problem is The Hobbit is slated for a December 2012 release. Let's just hope things don't blow up before then...kidding of course it is a misconception that 2012 is the end of the mayan calendar as that couldn't be further from the truth. Really looking forward to this movie. Can't wait to see Del Toro's vision of Smaug. Drop by and see my blog you arse. Del Toro quit the project last year; PJ will now be directing. However, it's possible that some of Del Toro's design elements may remain. Some information about those design elements surfaced recently, though, and Tolkien fans were far from happy with what they heard. Some of Del Toro's concepts sounded quite strange and un-Tolkien-like, including a Smaug that resembled a skinny flying axe, trolls that rolled up into balls like hedgehogs, and thorns growing out of Thorin's helmet because his name is "Thorin" (which makes absolutely no sense).